PSALMS THAT BRING HEALTH AND GOOD FORTUNE. Geoffrey Samson writes: If you believe in the existence of Mystic Powers then I have something to tell you. I am not writing what follows as an attempt to prove the existence of such powers: I write only for the benefit of those who already believe how they can benefit from such powers. People say I live a charmed life. I live in a $700,000 house with two swimming pools; own a Mercedes and Jaguar; but most of all I have a beautiful loving wife, and I enjoy perfect health. I can tell you that I dont have all these things because I have worked hard. I havent worked hard. In fact I am rather lazy, and I enjoy a leisurely life. I work as a freelance writer; and freelance writers dont usually experience the kind of wealth and good fortune that is mine. So am I just plain lucky or what? I tell people that I am lucky and leave them to go on envying me. Years ago I gave up trying to explain to people the real reason for my good fortune. When the publisher asked me to write this ad for my book I said, Fine  but only on condition that I dont have to try and prove the existence of the paranormal. My experience has taught me that people either believe or they dont. Of course there are also those who are simply curious, but secretly they really do believe but cannot quite yet admit it to themselves. If I were to tell the average person that I received the cash for the Mercedes from casting a spell I would be laughed at. I dont usually bet on the horses, but when I do I always win. I know I would be laughed at if I said I pick the right horses because I use the prayer which appears on page 51 of my book. Occasionally I get asked that if these spells and prayers are so potent then why isnt everyone using them? Indeed why arent they? What do you think? Those who laugh at the power of spells and prayers remain poor, unhappy and unloved. They pay a high price for their disbelief. But ironically peoples disbelief works to my advantage. I am always one step ahead because they dont believe. Of course I know you believe but you are in the minority. How many of your friends share your views? Without you actually knowing it you are already ahead of them in the business of winning in life. YOU ARE ALWAYS AHEAD OF THE CROWD WHEN YOU USE SPELLS, INCANTATIONS AND PRAYERS. The first step to succeeding is to use what others do not. You are going to have the whole weight of the Invisible World on your side! But am I making this all sound too easy? The chances are you may have tried these powers before and not succeeded. Do you know why you didnt succeed? At this point I must tell you there was a time when I never succeeded either. For years I cast spells and said prayers without a result. I thought the fault was with me. And in a way it was. The fact is that I DIDNT KNOW THE SECRET THAT MADE SPELLS AND PRAYERS WORK! But there was more to it than that. The plain fact is that many of the spells, etc, I used were simply useless. For ten years I struggled with spells, incantations and prayers from every part of the world, and I couldnt get anywhere with them. Why did I carry on for so long? What was it that kept me trying? Because I believed, and because I knew that these powers seemed to work for some people. Eventually I began to make progress. I finally discovered some formulae that did work. And thats when my life began to change; and since then I have never looked back. What I found was that for every ten spells that didnt work there was one that did. In other words if youve got the wrong spell you can work with it over and over again, but it will never work. The same goes for incantations, prayers and even psalms. I cannot explain this because one set of words looks the same as another. For example I researched different prayers to the various Greek gods: they all seemed much the same in phrasing and content, and yet the only one which I found worked was the one to Zeus! Over the years the Power Prayer to Zeus has never failed me financially! It will not fail you either when you follow my instructions! The prayer is so simple you will remember it after only two readings. I say it over and over before placing a bet or when I go to the casino. IF YOU NEED MONEY IN A HURRY THIS PRAYER TO VESTIA WILL WORK FOR YOU. I gave this to an elderly lady who was at her wits end struggling to make ends meet. This is also a prayer so simple that one can know it off by heart after only two readings. Within two days people were showering her with kindness and financial help; and she also won for the first time at bingo! and after all my trials and errors I also found the psalms that really work. I also found the secret of getting GUARANTEED results! Do you honestly think that the psalms, used by people for 3000 years, could possibly be without value? Of course you dont. But did you know that certain psalms are more potent than others, and that when said in a certain way cannot possibly fail to bring the results you seek? It took me ten years of mistakes to find the psalms which worked! And for years I got nowhere with incantations until I found the secret that made them work! 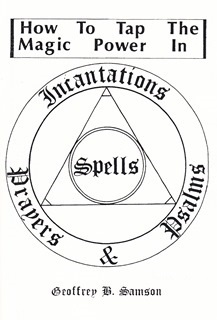 Incantations, like spells, consist of mystic words which can make physical things happen. Incantations do work, but you have to know how to make them work! LINDA INCANTED HER WAY TO A MODELLING CAREER! A very attractive young woman, her self-esteem was shattered after being physically scarred in a nasty incident. She tried the incantation you will find in chapter two. Against all the odds she was offered a modelling job which paid double her previous salary. Her new employer found a way of dealing with her scar. Lindas confidence soared and since then she has never looked back! The I-Am-Powerful Incantation, which Linda used, is to be said for renewing self-confidence, also for attracting money and good fortune in general. It doesnt seem possible that repeating a few words can make such a difference to ones luck. But this is the power of magic. I MET MY WIFE AFTER I USED THE SECRET THAT MAKES SPELLS WORK! I had given up on ever finding the right woman with which to share my life. I was past 40 and I had resigned myself to spending the rest of my life alone. Perhaps it was my fault: maybe Im not the easiest person to get along with. Needless to say I had tried various spells and prayers, but to no avail. But after I cast the spell which I describe on page 25 of my book I met the woman who would soon become my wife. I had desired an intelligent and companionable mate; but in Laurie I got not only this but a beautiful woman too! Lets face it: If you are shy or poor there is just no way you can ever get the kind of person you desire unless you try the power of spells and incantations that is. Every girl in the office where Louise worked seemed to be after the same guy. Sad, unattractive Louise would pine after him every day. What chance did she stand of getting him when she was up against others who were more attractive, glamorous and outgoing? Her only hope was a magic spell. Louise shook them all  it was her he eventually fell for. The other girls couldnt understand what she had that they didnt  but they didnt believe in the power of magic; and she never told them her secret! Mary was in great distress when she came to me  it seemed her marriage was falling apart as her husband became deeper and deeper entangled with an extremely attractive woman. I gave her the magic spell on page 23 of my book. Soon her husband had a terrible row with the other woman, and they split up! Marys husband later confided to her that that this was the result of her magic spell! This easy spell can be used by men as well as women. If you have a love problem this spell will solve it. Young Ron was an unskilled worker who drifted from one dead-end job to another. He hadnt a chance of ever making any real money, nor of amounting to anything in life. But after he used the prayer on page 77 of my book he found a job which paid better than anything he had before. And not only that, he was soon promoted. He was soon earning upwards of $35,000 a year  and that was twelve years ago! Not bad for a young lad who only months earlier had no prospects at all. Sarah, a poor widow with a small income, said the same prayer that changed Rons life. She believed in the idea of a great Cosmic pool of riches which I explained to her. Three weeks later she won a $18,000 lottery prize! With this windfall she went on a world cruise on which she met a well-to-do widower whom she later married!